COMPLETE 2018 CHRISTMAS SHOWS SPECIALS TV SCHEDULE! Preview: Living In Happy Place’s annual COMPLETE 2018 Christmas specials on tv, holiday parades, Christmas movies, and classic holiday favorite shows from the most popular channels in ONE list! Never miss your favorite! It’s that time again! Every year I compile a COMPLETE list of all the holiday shows for this season including channel info, dates, and showtimes so you don’t miss a thing this holiday season! Parades, Christmas movies, an even old classics- all in one place! ABC 2018 Holiday/Christmas Specials Schedule, CBS 2018 Holiday/Christmas Specials Schedule, NBC 2018 Holiday/Christmas Specials Schedule, TBS 2018 Holiday/Christmas Specials Schedule, The CW 2018 Holiday/Christmas Specials Schedule, and of course the Freeform 2018 Holiday/Christmas Specials Schedule (including Countdown to Christmas and 25 Days of Christmas)! I searched through each network so you don’t have to! Just print the (free) complete schedule, hang it on your fridge, grab your hot cocoa and enjoy this holiday tradition with your family! The 2018 TV Christmas Specials– All the Christmas/Holiday specials in one printable list! Nothing gets you in the holiday mood like watching Christmas movies! Set the DVR because there is no missing your favorites this year! Every year I go through the holiday television listings for all the big networks and pull together one, big, master list of holiday programs to share with you! Grab the printable list and hang it on your fridge! I cover everything from Thanksgiving to New Year’s so you can just print and watch. This is a great tradition to add to your Family Holiday Bucket List so make sure you subscribe to our email list and be the first to get it every year! This is truly a loabor of love. 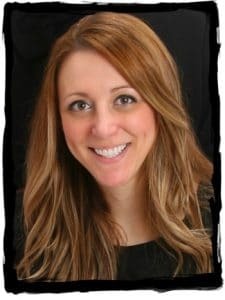 I started pulling a list together when my girls were toddlers and I couldn’t wait to share all of the Christmas shows with them! These movies and holiday classics are an important tradition for many families. That’s why every year, I can’t wait to share this list with you so you can snuggle up and pass this holiday right-of-passage on to your kids. Included networks: ABC, CBS, NBC, and Freeform. There may also be an occasional TBS or The CW if there is a Christmas special on that channel. The Disney Channel and Nickelodeon do have holiday specials for their popular shows but I cannot find a listing ANYWHERE. If you know of one, please send me an email and I will update! I choose not to argue with Freeform on what constitutes a “holiday” movie. I’m not sure Toy Story or Willie Wonka would be on my list- but if it’s on their schedule, I added it to the list. I tried to highlight holiday favorites and specials on the list. Freeform has A LOT of holiday movies so I add other network specials in BOLD. If you cannot wait to see your favorite, click on the link to order from our affiliate! Don’t forget to share this with your favorite Christmas movie lover! 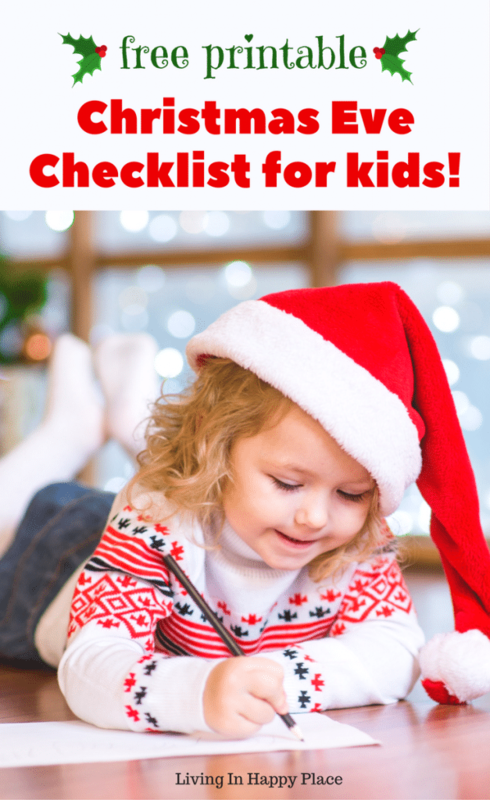 You might also like: Printable Christmas Eve checklist for kids! Take a much-deserved day off! 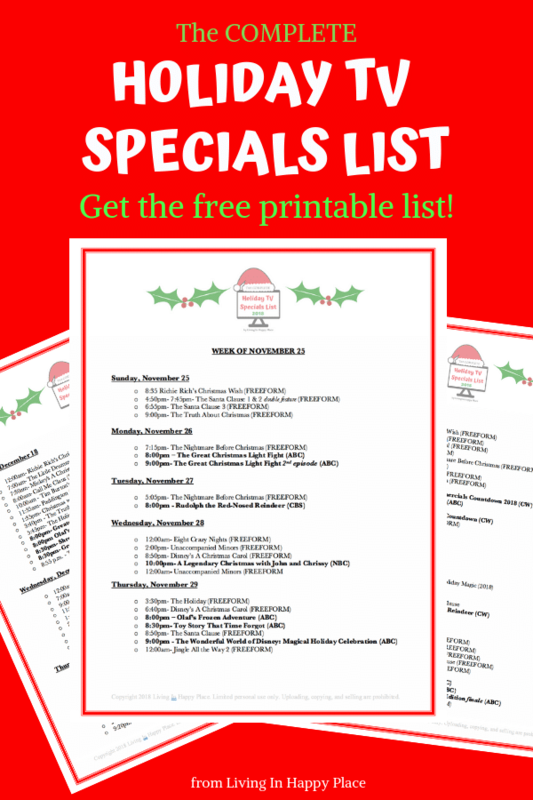 Have a wonderful Christmas and enjoy this list of Christmas specials! Sign up to the Happy Moms list and Get your free printable copy of the Complete 2018 Holiday Show Schedule to enjoy with your kids!